Hope I do not bore you with photos from Walt Disney World. 🙂 As a vacation spot, the place can not be beat for me and my family. As a photographer, it holds a treasure full of subjects and challenges. Over the course of the next few posts, I am going to talk about both aspects. The photos and techniques used should be of interest to you. I hope! Epcot has two parts to it. One is Future World which is like a permanent World’s Fair of Science and Technology presented in a fun way as to both educate and entertain. The second part is World Showcase featuring eleven country pavilions filled with the best from each in dining, arts, crafts, entertainment, goods and people. Each country has members from the host country. Here are three photos representing the day I spent at Epcot. 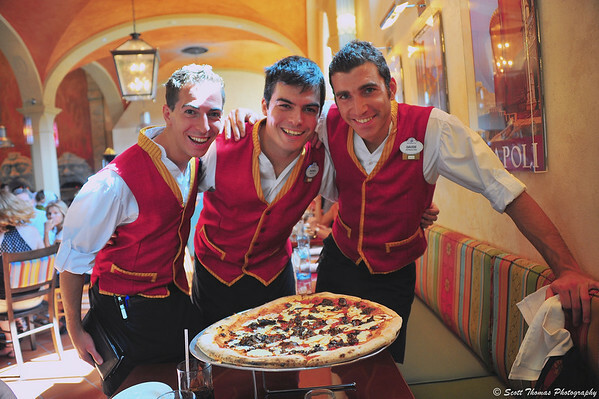 Young Italian servers who brought a pizza to our table in Italy's new Via Napoli restaurant in Epcot's World Showcase. Nikon D700/28-300VR, 1/125s, f/3.5, ISO 900, EV 0, 28mm focal length. We had lunch in Italy’s pavilion in the new Via Napoli restaurant which specializes in pizza. They even import water from Italy in the making of the crust. The atmosphere of the restaurant if lively and bright. The servers are young and energetic with most being from Italy like the three men you see above. Each are in different stages of their time at Epcot. The one on the left was working his last day after spending two years at Walt Disney World. He was looking forward to returning home and celebrating his brother’s birthday. The one in the middle had just started his adventure at Epcot and was being trained to replace the one leaving. We feel he will do well as he is outgoing and very attentive to the guests. The one on the right, he is in the middle of his time at Epcot but we felt he was the most important. It was he who brought us the large mushroom pizza pie you see. Yes, it is as good as it looks if not better. 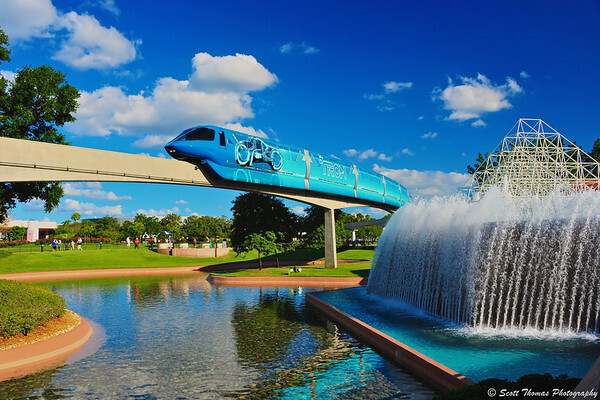 The TRON monorail moves past the reverse waterfall in front of the Journey Into Imagination pavilion in Epcot's Future World. Nikon D700/28-300VR, 1/250s, f/6.3, ISO 200, EV +0.3, 28mm focal length, polarizer filter. I waited for two other monorails to past by before the TRON monorail came by the reverse waterfall (the water flows up) in front of the Journey Into Imagination pavilion in Epcot’s Future World. The TRON monorail is promoting the upcoming theatrical release of the movie, TRON Legacy, with is a follow up to the first TRON movie which appeared back in 1982. This is one of those photos I had planned on photographing and knew this time of day would be perfect for it. I used a polarizing filter to enhance the colors. 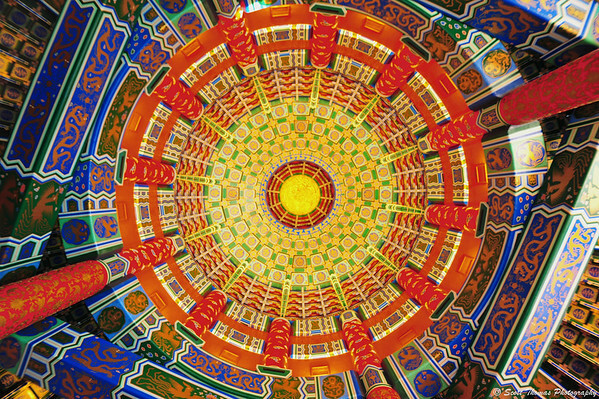 The ornate and colorful ceiling inside the Hall of Prayer for Good Harvest in Epcot's China pavilion. Nikon D700, Tokina 11-16mm, 1/50s, f/8, ISO 200, EV 0, 15mm focal length, rear-sync flash. When I purchased the Nikon D700, I planned on using the Tokina 11-16mm f/2.8 ultra wide angle lens even though it is a DX lens and designed for cropped sensors. I found it does not vignette at focal lengths of 15mm and 16mm. Above is the proof. 🙂 Until I can afford to get a real full-frame wide angle lens, the Tokina will have to do. I think I’ll be fine. This entry was posted in People, Travel and tagged 28-300mm, epcot, florida, italy, men, mushroom, nikon D700, orlando, pizza, restaurant, via napoli, vr, walt disney world, world showcase. Bookmark the permalink. What a great post and series of pictures ! I love them all for their different approach. A personal one for the three Italian servers – their smiles are… fabulous, and I imagine how good the pizza must have tasted 🙂 The reverse waterfall is so special and the colourful dome is spectacular, so many intricate patterns ! Thanks a lot for sharing these great images, Scott. Irresistible Italian smiles–and a floating pizza! There is no end to wonders in the Disney empire. The monorail photo is very effective. All those gorgeous blues! Isn’t it always the case that as soon as we find out what we can do with this tool we want that one over there that will do even more? Doesn’t matter what field we’re in, we always have eyes for the next step up. I have to keep reminding myself that great works have been written on scraps of bark with quills. And perhaps greater ones on the wind, being only spoken. But that’s another post entirely. The pizza was sitting on a stand but the angle does make it look like it’s floating. It was a perfect Florida day with lots of sunshine and blue skies! I coveted the Nikon D700 for a long time so, for now, I am very satisfied with what I have. Still have a lot to learn about how to best use the D700. The Tokina is a compromise I am willing to live with for a long time as my wide angle lens. Wonderful images, especially the last one. I enjoy your photos. The first one is my favorite one. Oh, like them tall, dark and handsome do you? 😉 The guys were a lot of fun and excellent servers. Glad to see you had a great time at Disney! We didn’t find the pizza to be all that amazing (albeit VERY pricey), but we did feel the dough was exceptional. Perhaps they will improve. Apps were disappointing (we sent our original order back and the hostess tried to appease us with two other options) so we will stick to Tuto Italia since the food is much better! In any event, you can’t beat the personalities you captured in the waiters! The TRON tram was impressive to see and you knew it was coming due to the shouts of ‘TRON!’ from the kids who would inevitabley sight it first! That last picture is awesome! Although my eyes are wishing it could have been centered more, the colors are tantalizing my brain. Great stuff! You should be shooting for a travel magazine, Scott.